A California-based online electronics retailer has been cited by the US federal authorities for importing and marketing counterfeit Samsung and Blackberry smartphones. Panasystem Corp of Canoga Park, Los Angeles, had been selling phones marked with unauthorized or invalid labels falsely indicating that the devices were certified by the Federal Communications Commission (FCC), according to the agency's Enforcement Bureau. "We will not tolerate the importation and marketing of counterfeit devices," said Travis LeBlanc, acting chief of enforcement at the FCC. "The trafficking of these devices not only robs the intellectual property of legitimate manufacturers, it harms consumers by failing to provide them with safe and certified smartphones that comply with the FCC's equipment authorisation process," he added. 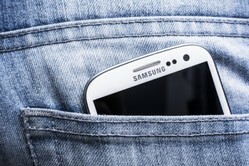 The FCC investigation identified the smartphones imported by Panasystem as counterfeit Galaxy S Duos and Galaxy Ace models, which were labelled with seemingly-valid Samsung FCC Identifiers. It also uncovered fake BlackBerry model 9790 devices. FCC equipment database on the actual certified devices - which rendered them illegal for sale in the US. The FCC citation means that Panasystem is risking a hefty fine of up to $16,000 per day unless it takes immediate steps to desist from importing and selling the fakes. It may also face criminal sanctions, including the possibility of imprisonment of company officers.